VICTORIA, BC – Phillips Brewing has announced the annual return of a pair of popular Hallowe’en-themed seasonal beers. Plucked from the patch, this Phillips seasonal classic combines fresh pumpkin, ginger, cinnamon and nutmeg with a full-bodied ale. It’s a witches brew packed full of fall harvest flavour that, like many ghostly spirits of the season, has a tendency to disappear quickly. Our crooked smiles are extra wide as this special Pumpkin seasonal uses a barrel-aging trick to put the finishing touches on a pumpkin treat! Crookeder Tooth is brewed full-bodied with loads of fresh pumpkin and then carefully aged in selected freshly-emptied whiskey barrels. The result is a slightly sweet, gently spiced brew that blends fresh pumpkin flavours with soft velvet vanilla. 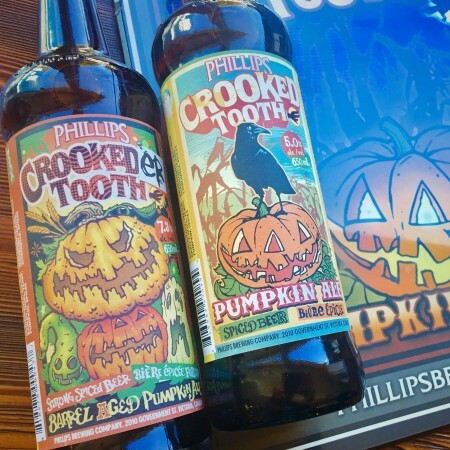 Crooked Tooth and Crookeder Tooth will both be available at Phillips and select private liquor stores in BC for a limited time.